The nodes directive declares the name of a node set and its shape. A node set can have a multi-dimensional shape. The nodes directive declares 1-dimensional node set p which has 4 nodes. In XMP/C, the node set consists of p, p, p, and p. In XMP/Fortran, the node set consists of p(1), p(2), p(3), and p(4). The nodes directive declares 2-dimensional node set p which has 6 nodes. In XMP/C, the node set consists of p, p, p, p, p, and p. In XMP/Fortran, the node set consists of p(1,1), p(2,1), p(3,1), p(1,2), p(2,2), and p(3,2). The ordering of the elements in a node set depends on the base language, C and Fortran. An asterisk symbol can be used in the nodes directive to declare a dynamic node set. The program declares 1-dimensional dynamic node set p by using an asterisk symbol. The size of a dynamic node set is determined at runtime (at the beginning of the execution). For example, when the user runs the sample program with 3 nodes, the node set p will have 3 nodes. The user also can declare multi-dimensional dynamic nodes with an asterisk symbol. When the user runs the sample program with 12 nodes, the node set p will have a shape of  in C, and (3,4) in Fortran. The user can use only one asterisk symbol in the last dimension of the node set. The dynamic node set may interfere with compiler optimizations. Static node sets may achieve better performance in general. The user can declare a partial node set from the existing node set. Partial node sets can be used to optimize inter-node communication by reducing the number of nodes participating in the communication. In line 1, a node set p which has 16 nodes is declared. In line 2, a partial node set q from the first half of p is declared. In line 3, a 2-dimensional partial node set r from the latter half of p is declared. The user can declare an 1-dimensional node set from a multi-dimensional node set. In line 1, a 2-dimensional node set p which has 4x2 nodes is declared. In line 2, a partial node set row from a single row node set of p is declared. In line 3, a partial node set col from a single column node set of p is declared. The colon symbols used in the sample program are triplets which indicate that all elements in the dimension are used to declare the target partial node set. The asterisk symbols indicate that the current executing node will be used to declare the target partial node set. For example, col is p[0:2] on node p/p and is p[0:2] on node p/p in XMP/C. Likewise, col(2) is p(1:2,1) on node p(1,1)/p(2,1) and p(1:2,2) on node p(1,2)/p(2,2) in XMP/Fortran. In XMP/C, both p and p will be row. Likewise, p, p, p and p will be col in each execution context. 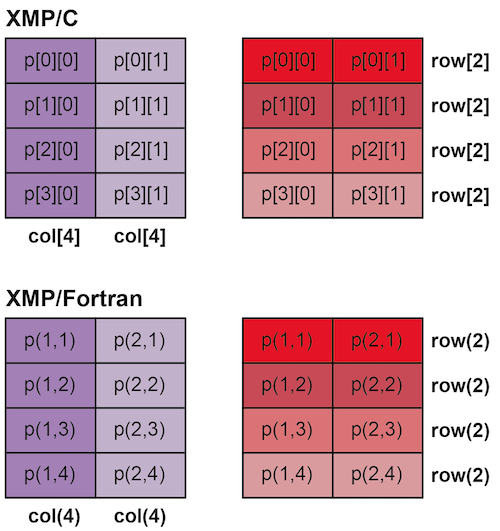 In XMP/Fortran, both p(1,1) and p(2,1) will be row(1). Likewise, p(1,1), p(1,2), p(1,3) and p(1,4) will be col(1) in each context. The syntactic meaning of asterisk symbols in the node set references are different when declaring a node set and regular expressions in on clauses.